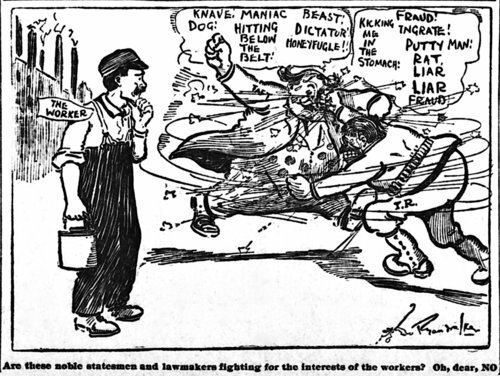 Political cartoon drawn by Ryan Walker for the socialist newspaper, Appeal to Reason, which was published in Girard, Kansas. The cartoon depicts a concerned worker watching Republican presidential candidate William Taft and Progressive presidential candidate Theodore Roosevelt brawl and curse. Socialist candidate Eugene Debs and his running mate Emil Seidel received 6% of the popular vote in the 1912 election.